FLINTSTONE, Md. — Well, at least he kept it in the trail running family. 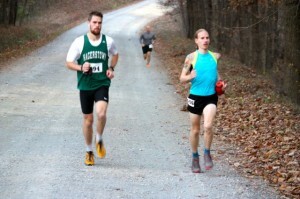 Michael Daigeaun, right, overcame a strong start by Wade Miller, left, and crushed the Fire on the Mountain 50K course record. 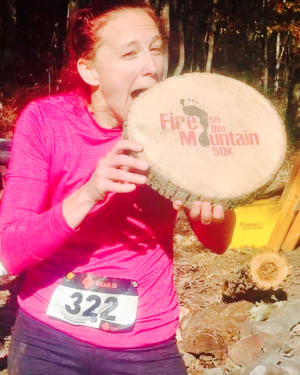 overcame a strong start by Hagerstown harrier Wade Miller en route to a record-setting victory in the fifth and final Fire on the Mountain 50K race on Sunday in Green Ridge State Forest. 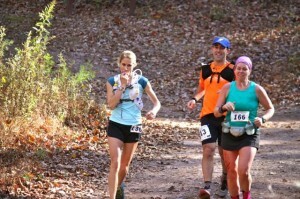 Daigeaun, 34, of Philadelphia, Pa., is a member of the Virginia Happy Trail Running Club. In 2012, fellow VHTRC member Brad Hinton established the then-course record of 4 hours, 38 minutes and 7.1 seconds in what remains the closest finish in race history (42 seconds over runner-up Adam Hill, of Ontario). On Sunday, Daigeaun paced with Miller, a 24-year-old established short-distance road racer competing in his first ultra early on. And through Aid Station 2 at Mile 8.9, Miller was ahead — by more than a little. But midway through the green trail, the second of four separate sections of the 32-mile point-to-point footrace, Miller went left when the directional arrow and orange ribbon indicated he should continue straight. The wrong turn, coupled with stomach cramps lingering from a nearly week-old bug, led Miller to a group camp site in Green Ridge — far off course — asking for a ride. That left the race, and the record attempt, to Daigeaun, who finished in 4:31:59.5. Amy Brockey (in pink) turns onto the red trail, the first of four sections of the 32-mile, point-to-point Fire on the Mountain 50K in Green Ridge State Forest. Amy Brockey, meanwhile, finished first in what is the closest finish among female contenders in event history. Brockey, 34, of Frederick, crossed the finish line in 6:34:35.3 — less than 90 seconds ahead of Potomac Highlands Distance Club member Megan Hamilton, 38, of Ridgeley, W.Va. (6:36:02.3). The two were captured by PHDC photographer MacKenzie Spradlin as they came off the green trail and approached the midway point via the hill that is Kirk Road. 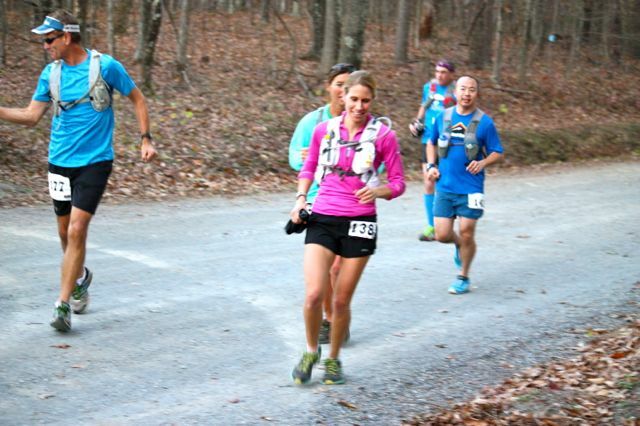 Amy Brockey, left, and Megan Hamilton approach the midway point still side by side on Sunday at the fifth annual Fire on the Mountain 50K.